The good news: a headset exists that helps you “see” like a dolphin. The bad news: you’ll have to build this “DolphinView” headset yourself. The other good news: it’s not too complicated or expensive, at least according to its inventor, Andrew David Thaler, an ecologist and the editor-in-chief of conservation site Southern Fried Science. First, the dolphin science: dolphins have excellent eyesight, but they are also able to navigate using echolocation. Essentially, they make clicks using a fatty part of the jaw called the melon. These clicks bounce off of objects around them and sound different depending on where the object is. The dolphin then uses its jaw to interpret this information to figure out what’s happening. To make DolphinView headset, Thaler used a simple LIDAR unit to create a system that pulses when an object gets closer. But how do you get these pulses to the jaw? 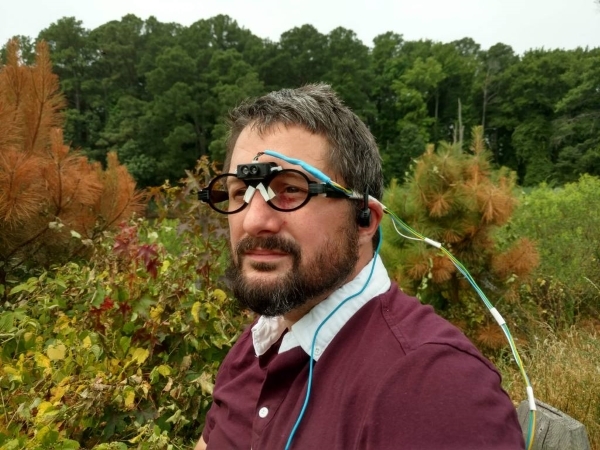 So Thaler connected the LIDAR to bone-conduction headphones. You can find instructions on GitHub and Thingiverse. The materials cost less than $100, and the code is “barely 15 lines,” though you do have to combine a few components. To be fair, we don’t know enough about dolphins to say that this is exactly how they “see.” But the concept is solid and, come on, who doesn’t want to experience a new way of seeing the world?